This tour is unique in that there’s a special focus on the hill tribes of Northern Thailand and Laos. The people from these ethnic minorities have settled into the region after leaving their home countries of China, Burma and beyond.They are often marginalized and don’t have the same access to education and healthcare that the Thai have. They do their best to scrape by and some of their income comes from souvenirs and trinkets sold to tourists. Their circumstances are sad. But I feel good knowing that we’re helping them (often women) support their families. During our visit to Chiang Mai, we visit an organization called WEAVE–Women’s Education for Advancement and Empowerment–and learn about the women and families that WEAVE supports. 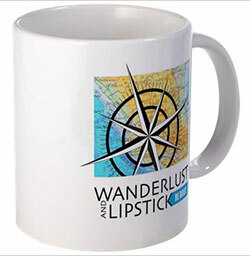 Through our own non-profit, the WanderWorld Foundation (website coming soon! ), we make a donation to support this program. It’s always an emotional time for our group because of the stories we hear about the history of these lovely people and their families who are literally trying to survive day to day. In addition to learning about the hill tribes, during the tour, we dive into both the Thai and Laotian culture and food. The food!!! 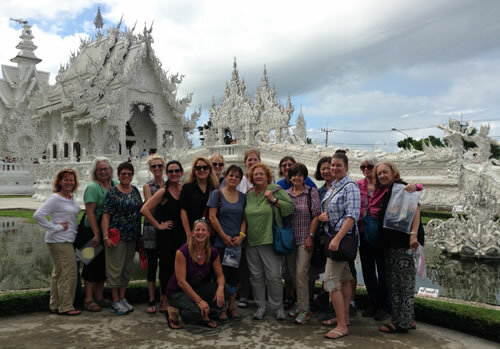 Our tour participants take cooking classes, visit markets and experience some of the best regional food from Bangkok to the north and then onward to Luang Prabang, Laos. We visit the White Temple (Wat Rong Khun) in Chiang Rai. This is a privately owned temple, designed and constructed byÂ Chalermchai Kositpipat. It’s crazy intricate and like nothing you’ve ever seen. There’s so much going on in this sculpted temple that it’s impossible to take it all in. 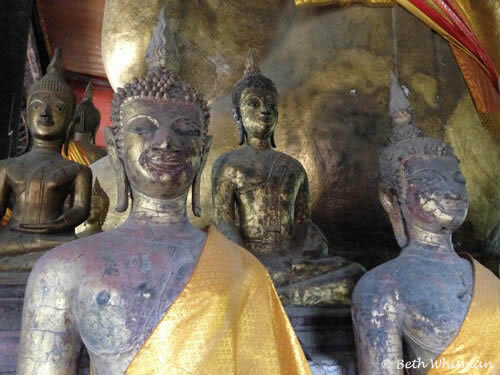 While our intention is not to overwhelm you with temples, we do visit a number of special temples throughout the tour. This will give you the chance to see various styles from Bangkok, to Thailand’s north, and then in Luang Prabang (where the photo above was taken). Non-Buddhists will get a lot out of these visits, just as non-Christians can appreciate the magnificent churches of Europe. As part of the tour, we overnight at a homestay in the mountains outside of Chiang Mai. This was a singularly spectacular experience for our group in 2014. Not only did we get to meet and stay with a family but we got to attend a very special festival that was taking place in this small village. 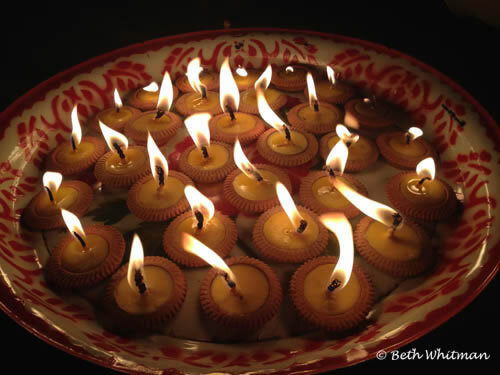 We visited the local temple, lit candles and listened to a Buddhist monk chanting along with most of the community. 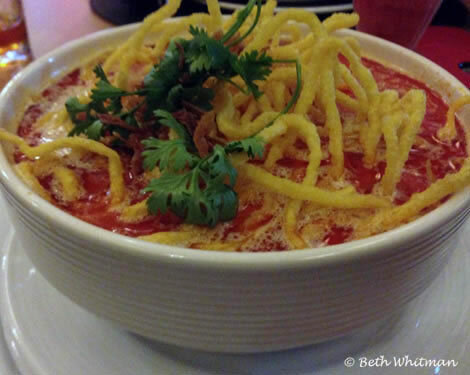 I had never heard of khao soi prior to our 2014 tour when our guide took us to a restaurant that specializes in this amazing soup (which originates from Burma). I’m sure I’ve seen it on the menu at Thai restaurants but because I didn’t know what it was, I never ordered it. Blown away. That’s what I was. Not all Thai restaurants offer it but I am in search for the best in Seattle (haven’t found it yet). 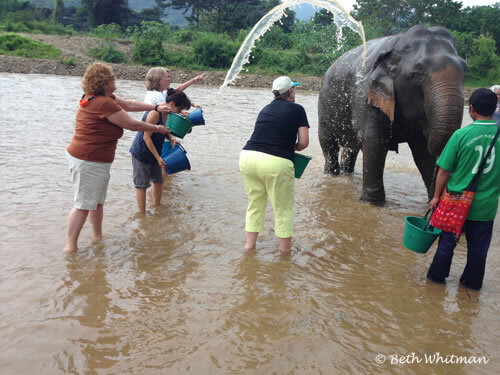 One of the most fun things we do on our Thailand and Laos tour is to spend a morning at an elephant sanctuary. This facility rescues and rehabilitates elephants that have been injured, abused or are ill. We got to learn about, wash, feed and “pet” these huge, leathery pachyderms. How awesome is that?? I love Southeast Asia so much. And I feel really fortunate that I usually travel there about twice a year (well, I’m usually in and out of Bangkok that often). Even though some areas have become really touristy, that hasn’t taken away from how warm the Thai people treat visitors. 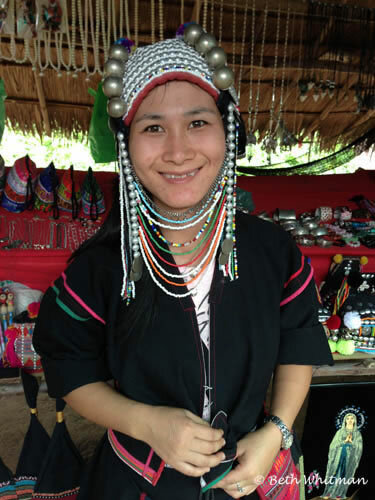 To secure your spot, click on the Register Now button on the Northern Thailand Hill Tribe Tour itinerary on the WanderTours site or send in your registration form with a check. The tour will sell out. There’s no time to hem and haw about it. Just do it :-).